Once your pool has been properly closed, please do not totally forget about it ! With a minimum of care and maintenance throughout the winter months, your cover will last longer and your pool will open up with less problems in the spring. Follow the instructions below for best results. Tightness: The springs and straps on your cover will need to be adjusted from time to time, especially during the first few seasons of use. The cover material, as well as the straps, will start to stretch as soon as the cover is initially installed. THIS IS NORMAL. Check cover periodically over the first few seasons of use, and retighten the straps as necessary. Water Level: The water level in your pool should be kept at or just below the skimmer when the cover is in use. However, the water level should not be lower than 18" from the top of the pool. If your water level goes down further than 18", the cover could stretch out too much and either rip or cause anchors to pull out of your deck. If you experience a lot of precipitation over the winter months when the cover is in use, it is possible that the pool could fill up, no longer allowing the water from the cover to drain into the pool. Check pool water level periodically over the winter, adding or removing water when necessary with your garden hose or cover pump. Water Clarity: Remember, this is a mesh pool cover. Sunlight and rain water will get through the cover to the pool water. Most pools covered with this type of cover will remain clear until April or May, depending on the weather. It is strongly recommended that you open your pool early to avoid the green "swampy" water that occurs when strong sunlight and temperatures over 80 degrees are present. As a rule of thumb, you should open your pool prior to May 15 to avoid a green water situation. It is also a good idea to add 2 or 3 gallons of chlorine shock to the pool in the beginning of April to ensure good water clarity at opening time. Water Level: The water level in your pool should be kept at or just below the skimmer when the cover is in use. The water level should not be lower than 18" from the top of the pool. If your water level goes down further than 18", the cover could stretch out too much and either rip or cause anchors to pull out of your deck. For most manufacturers of Solid Spring type pool covers, this could void your warranty ! If you experience a lot of precipitation over the winter months when the cover is in use, it is possible that the pool could fill up, no longer allowing the water from the cover to drain into the pool. Check pool water level periodically over the winter, adding or removing water when necessary with your garden hose or cover pump. Cover Draining: Although the mesh center drain panels of your cover will allow rain water to drain into your pool, they are not designed to drain off every drop of water from your cover. Because of the way that the cover straps are situated, some water will puddle in areas of your cover. THIS IS NORMAL AND THERE IS NO WAY TO STOP THIS FROM HAPPENING. Do not try to over - tighten the cover straps in an attempt to get all the cover water to drain into the mesh panels. It will not work, and you run the risk of over - stretching the straps and springs. For most manufacturers of Solid Spring type pool covers, this could void your warranty ! The center mesh drain panels are primarily designed to let most of the water drain off the cover. 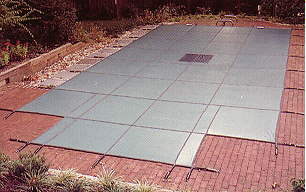 Some Ultra-Loc Solid covers do not come with drain panels at all and will need to be pumped off with a pool cover pump from time to time. This is normal. These covers come with cover draining pumps in most instances. Do not let tons and tons of water and/or leaves and debris sit on your cover for long periods of time. Utilize the cover pump that came with your cover for best results. Mesh Panel: To ensure proper drainage, make certain the mesh center drain panels are clear of leaves and debris. Check cover periodically over the winter and remove debris from panels as it accumulates using a pool leaf net, vacuum pole or broom. This is especially important for pools located in heavily wooded or treed areas. If you walk on the cover to get to the panels, make sure you are not wearing shoes with spikes or heels, as this could puncture the cover. Failure to keep the mesh panel free from leaves and debris will result in improper water drainage from the surface of the pool cover and will cause too much water weight on the pool cover. This could cause the cover material, straps and/or hardware to stretch or break. For most manufacturers of Solid Spring type pool covers, this could void your warranty ! Water Clarity: Remember, these covers have mesh drainage panels. Some sunlight and rain water will get through the cover to the pool water. Most pools covered with this type of cover will remain clear until April or May, depending on the weather. It is strongly recommended that you open your pool early to avoid the green "swampy" water that occurs when strong sunlight and temperatures over 80 degrees are present. As a rule of thumb, you should open your pool prior to May 15 to avoid a green water situation. It is also a good idea to add 2 or 3 gallons of chlorine shock to the pool in the beginning of April to ensure good water clarity at opening time. nor distributed in any manner without the prior expressed written consent of PoolAndSpa.com Inc. Any Copyright infringement will be prosecuted to the fullest extent of the law. .